A stewing hen has such deep chicken flavor to offer that is worth the lengthy cooking time required to tenderize its modest amount of meat. A stewing hen is an older laying chicken that is no longer productive. For the best quality, buy stewing hens from a farm that raises its birds on pasture. In this recipe, a hen stews with wine, herbs and tomato until falling-off-the-bone tender. The next day, the meat is picked and returned to the pot with the resulting tomato sauce to make a rich ragu. Serve the ragu over mashed potatoes or soft polenta, or on penne pasta with grated pecorino cheese. Remove legs from the bird and set aside. Cut off backbone, any excess fat gathered around the cavity, and wing tips; reserve bones and fat for stock. Set breast section on cutting board, meat side up. Use a mallet or other heavy object to whack the breastbone so that it cracks and lies flat. Sprinkle legs and breast with salt and pepper. Preheat a dutch oven or other heavy pot with a lid over medium heat. Add oil. Add chicken and onion wedges and cook until the chicken browns on both sides, about 10 minutes. Turn onion wedges to prevent burning. Add rosemary, red chile flakes, and garlic, and sauté until garlic is fragrant. Add wine and let it cook down until almost evaporated. Add tomatoes, water, ground cloves, and lemon zest and stir. Turn heat down to very low and cover pot with a lid. Stir occasionally. Stew the chicken until the meat is tender when poked with a fork and beginning to fall off the bone; this may take more than 3 hours. The chicken should cook at an easy simmer. If the pot seems dry, add ¼ cup of water. Let the chicken cool to room temperature in the tomato sauce and store overnight. The next day, pick the chicken meat off the bone and return it to the tomato sauce. Save the skin and bones for making stock. Reheat ragu, adding additional water to loosen if necessary. Adjust seasoning, adding lemon juice if using. Sprinkle with parsley and add a drizzle of extra virgin olive oil to finish. 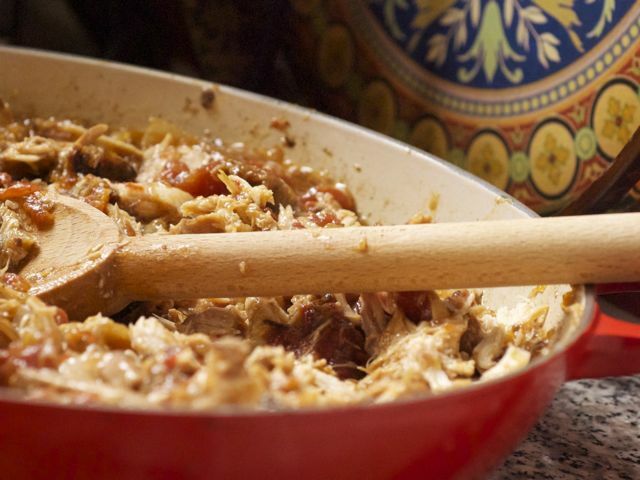 If you use a regular chicken, which will have much more meat than a stewing hen of similar weight, you will need more tomatoes for the ragu; add another 14-oz. can.